"Hurry Up and Get Ready," I shouted to Forrest. "Make sure you bring hiking, paddling and climbing stuff – do you have everything?" Another trip, but not our normal set of gear. Forrest Shearer is a professional snowboarder and I am a professional skier. We travel the world for the best powder and terrain– from Alaska to New Zealand. 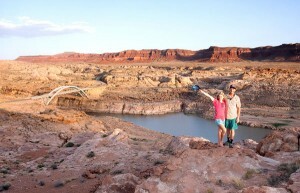 We thought we'd seen it all…until it came time to explore a destination close to home, Moab, Utah. Rushing out the door is our normal routine, but it's usually en route to the airport to catch a flight or up the hill to shred Utah pow. Traveling around the world to explore snowy peaks sounds glamorous, but it has its gritty downside - getting stranded, carrying over a hundred pounds of luggage, or trying to sleep on overnight flights. This trip, we didn't worry about overweight baggage or waiting in security lines. We were taking a road trip, baby, and even though we were in a hurry, we felt free. It was a warm, sunny spring day and we were happy to slide into flip flops instead of ski boots. As we hit the road, the sense of freedom and adventure grew. With my toes hanging out the window and the fresh breeze in my hair, I started daydreaming about our trip. 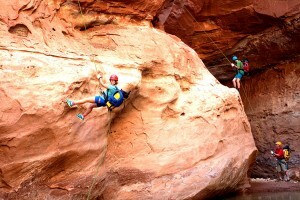 On our agenda: an action packed two days of stand up paddling, canyoneering and rock climbing. After a few short hours, we arrived in Moab and checked into our hotel, the Sunflower Hill Bed and Breakfast. Walking in, it felt like a tropical oasis in the desert; the pool and hot tub nestled in the green foliage of outdoor gardens. We could've spent the rest of the day there, relaxing, exploring the grounds, but adventure calls, so we changed into board shorts and bikinis and ran out the door. 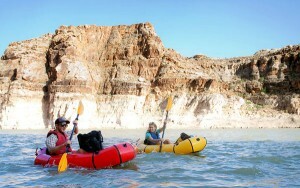 We met our river guides, Paddle Moab, loaded up and took off towards the Colorado River. It was a kick to see a van loaded with oversized surfboards in the middle of the desert. When we pulled up to the fine, sandy beach, the boards didn't look so out of place anymore. The sand, the slight breeze, I thought, "Are we in Utah or are we at the beach?" The gentle current of the Colorado is bliss on a stand up paddle board, slowly taking you through the most breathtaking scenery. The reflection of the purple blue sunset sky on the water with the contrast of the red and orange towering cliffs looked like a painting. We paddled through one section of mini rapids –The water was warm, and it felt good to take a dip. The shores of the river are so inspiring, I could spend a day just lying out on a blanket, painting a picture, or building a sandcastle. It's a beach like no other. 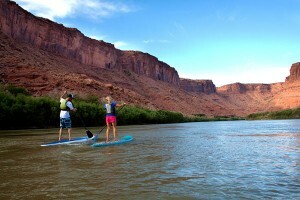 Paddle Moab offers customized stand up paddle board tours on the Colorado River for everyone from athletically inclined first timers to seasoned pros ready to tackle whitewater rapids. The guides are friendly and put safety first. 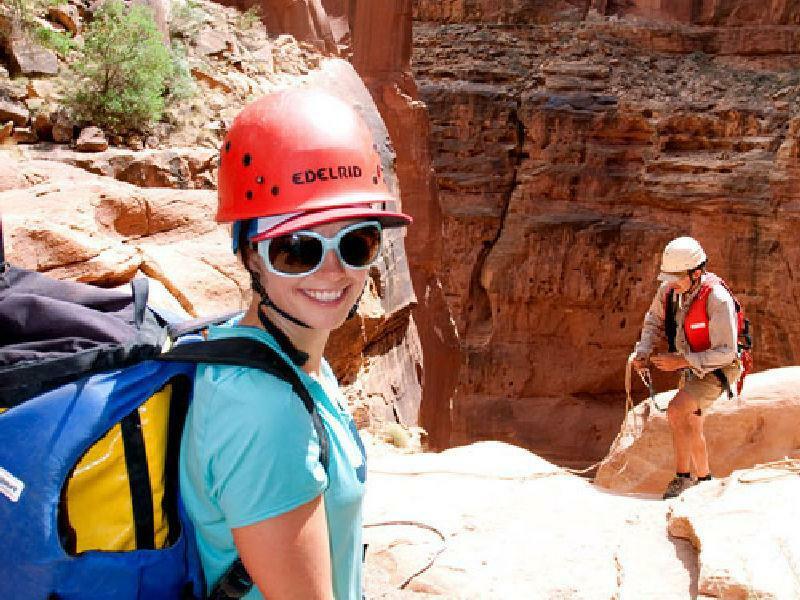 This is a must do for any Moab adventure! Exhausted from the day's adventures, we went to bed early to rest up for the adventure ahead! We woke up early to catch the homemade breakfast at the Sunflower Inn, a meal not to be missed. We sampled everything: homemade pancakes, waffles, berries, eggs, bacon, granola, yogurt, fresh fruit, and lots of coffee before heading off to the Moab Airport to catch our flight. We checked in with Red Tail Aviation, met our pilot, loaded our backpacks into the single engine Cessna and took off over the desert. Destination, Hite, Utah. Always a window seat girl, I was delighted to see Southern Utah's rugged terrain from a bird's eye view. It's easy to see why so many movies are filmed here. It looks like another planet. Disney filmed John Carter here for that reason; the kid's flick takes place in Mars. Other notable big screen Moab cameos include Indiana Jones, Thelma and Louise, Mission Impossible II and The Hulk. As I peered out the window at the terrain below, I'd see a flat spot on the horizon and then, the edge of the world dropped off hundreds of feet into a deep river canyon. Plateaus bubbled up from the earth. Towering chimneys cast long shadows on a slope full of boulders. The color palate is like no other landscape on earth, bright, rust red, sandy yellow, smoky grey, dark black in the shadows, and bright green vegetation next to the river. The mighty Colorado River twists, turns and coils like a snake. With the window open, a cool breeze and the faint scent of aviation fuel, I was excitedly nervous for my first time canyoneering. 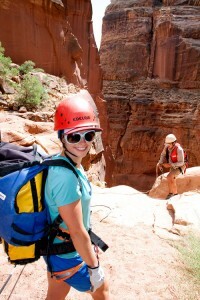 On the itinerary was a descent with three separate rappels, two of them over 200 ft long. Our canyon exit was the Colorado River, so we were carrying pack rafts to paddle out. ed at a conversational pace through mostly flat plateau terrain, slowly descending, and then, without warning, the earth ended. We reached the first rappel. I looked down over the edge and could not see the bottom. There was a slit in the earth to unknown darkness. Matt and his assistant guide set anchors. I appreciated his attention to detail and safety. It was still early, but the temperature was quickly rising. Belay device hooked up, I stepped off the edge of the world, scared and exhilarated, walking down the vertical side of a cliff, defying gravity. The rappel went on and on. About halfway through, the wall turned to an overhang. I was spinning in space like a spider, dangling, legs kicking, yearning for something, but there was just space and air. "Relax, take a deep breath, mind over matter," I said to myself. I looked down, oh wait, that was a bad idea. Still a long way to go. Creeping along, slow and steady, I finally made it to the soft muddy canyon floor. I was shaking, smiling, and then laughing, deep in a slot canyon, a plane ride away from civilization. I watched the rest of the group descend from a safe small cave in the canyon. Even the tiniest rock falling from the top landed with a thundering roar at the bottom. We ate a quick lunch in the cave and continued. 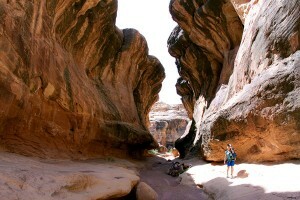 The huge walls loomed over us; Matt said fewer than 100 people had been in this canyon. A little mud frog leaped by, I admired his strength to survive in this harsh climate. The walls around us were skyscraper high and I craned my neck to see the top. Our next rappel was much easier, instead of an overhang, it was a waterfall runnel, slightly sloping. From there, we got our first glimpse of the river. Our final rappel was the most interesting – instead of anchoring to bolts, we did what's called a simultaneous rappel, or simulrap, putting the rope over an arch and descending on either side in tandem. Matt stood in the middle and made sure we moved in union. This was my favorite rappel; Forrest and I, rapping at the same time, moving in a synchronized dance down the mountain. We touched down gracefully into shin deep mud. It was cool and refreshing. After a short mud trek, we inflated our packrafts and started paddling. The sun was getting low. We encountered a headwind so I pushed on, paddling hard. We finally reached a bridge, indicating civilization was nearby. We reached the take-out with just enough daylight left, loaded up and began the 4 hour drive back to Moab. Thank goodness the ma and pa restaurant in Hanksville was still open serving fresh burgers, French fries and chocolate shakes. I fell asleep on the van ride home, a happy, satisfied adventure traveler. Canyoneering isn't only for the young and fit – it can be enjoyed at any age. Even those who lack experience can learn the specialized skills to get the pulse racing. Those who aren't looking for an adrenaline fix shouldn't count it out – it can be mellow and relaxing. Hire a good guide to customize your experience and prepare to have fun on a safe, enjoyable adventure. 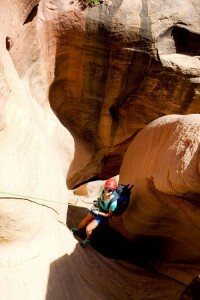 What I found most rewarding was that we explored this remote canyon in a human powered and self-supported way. The next morning, the alarm went off early. Climbing day. We grabbed a quick coffee and breakfast burrito at the Love Muffin, a young, hip, art café and local hang out, met our guide, and drove to a climbing area called the Ice Cream Parlor. There were myriad routes on the wide wall. Something for everyone, whatever your favorite flavor, hence the name. Our guide taught us some basic crack climbing techniques – jamming your hands and feet into a narrow crack. Once you get comfortable and trust the deceptively grippy sandstone, it's amazing what you can ascend. 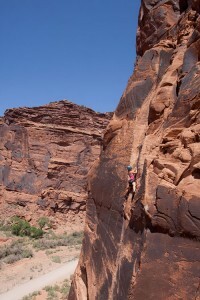 We took turns shimmying up and rappelling down the redrock. We climbed four or five routes and were pumped! We stopped at the Peace Tree Juice Café for a quick sandwich and smoothie and started our drive back to Salt Lake City. In and out in less than two days time with a whole vacation's worth of adventure under our belts. Having guides ensured we could do so many activities in such a short period of time. All of our guides were safe, helpful and accommodating. They are passionate athletes themselves and it felt like we were working together as a group, which makes for a great adventure dynamic. Even though we did so much, we barely scratched the surface. In Moab, there's so much to see, you could spend months here exploring the national parks, mountain biking trails, rivers, and slot canyons. Whether you want to swim at the sandy beaches on the Colorado, check out Native American petroglyphs, paint, hike, bike, run, climb, canyoneer, raft, kayak, SUP, eat, relax, Jeep, camp, backpack, taste locally brewed beer, visit a winery, get a massage, eat sushi, the list is endless. Adventure capital USA. We didn't have time to shop for souvenirs on this trip, but we did bring home fond memories, bragging rights and a couple hundred photos. "London, Paris, Tokyo, Moab," that bumper sticker doesn't lie. It's is just as good and glamorous as any exotic vacation, only much easier to get to. You get a lot of bang for your buck. Sure, we love venturing off to faraway lands for international trips, but this time, instead of spending precious vacation days dealing with airport layovers and sleeping in planes, we got to spend extra time playing and having fun. Isn't that what it's all about?